How to set up Automatic Replies (Vacation Notice) in Office 365? 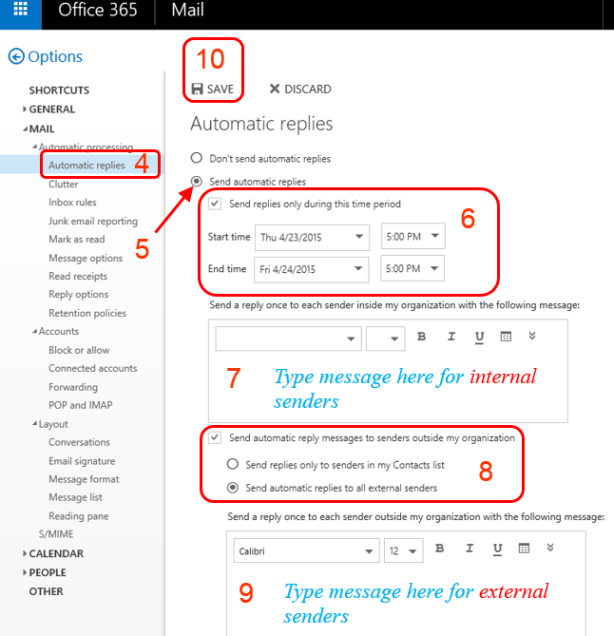 You can set up Automatic Replies (Vacation Notice) in your Office 365 (O365) account by using Automatic Replies which is provided in either MS Outlook or Office 365 Outlook Web App (OWA). For the set-up procedure of MS Outlook 2010, please refer to here. Click gear icon at the top-right corner of OWA window. Select Mail under Your app settings. Select Automatic replies under Automatic processing of MAIL. If you want to use schedule, you will enable Send replies only during this time period check box. Then specify Start time and End time. Type message for internal senders in text box for sender inside my organization. If you want to send message to external senders, both options of Send automatic reply	messages to senders outside my organization and Send replies to all external senders will be selected for sure. Type message for external senders in text box for sender outside my organization. "Internal Sender" means the email sender is also a CityU O365 user whoes Email Address ends with "@my.cityu.edu.hk". If you do not enter text in the text fields and the Automatic Replies are enabled, senders will not receive an auto-reply message. Select the Don't send automatic replies to disable them. By default, Automatic Replies are disabled.